The recommended way to download the Toast-UI Grid as a package is through a package manager for the front-end like the bower or the npm. If you've installed the bower, run this command in the directory of your project. Also, you can download it using the npm since version 2.3.0 or later. This downloads all necessary files for the Toast-UI Grid, including all dependencies. You can also download these files manually at the dist directory or releases page. But you have to download all dependencies below manually as well. Now you can include the script files to your html page. If you download files through the bower, they will be in the bower_components directory. You need to include the CSS file as well. Similarly, you can download and include files through the npm. In this case, the bower_components directory is replaced by node_modules. There is one more thing to do. The Toast-UI Grid uses two images to display a loading-indicator and icons, ani_loading.gif and icons.gif respectively. In the CSS file, paths of these images are specified with the relative path ../images/. If you place the images in the different paths, you should find and replace all paths of the images in the CSS file to the correct paths. To use the Toast-UI Grid in your page, you should create an instance of tui.Grid like example below. This uses the Grid class as a namespace when you include the script files in your html page. Beginning with version 2.3.0 or later, you can import the Grid class in the CommonJS module format. The Grid class receives an option object as a parameter, in which only el field is required. The value of el should be a jQuery object of the HTML element you want to use as a wrapper. As this does not create an HTML element automatically, the wrapper element must exist in advance when creating the instance. Another options like data, virtualScrolling, editingEvent are optional, and you can find more options in detail at the API page. 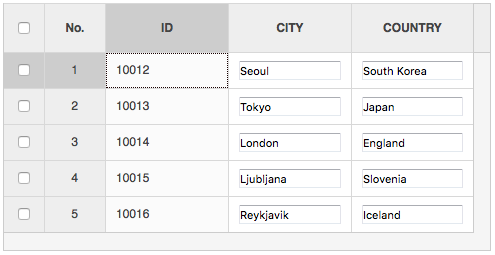 Before you add data to the Grid, you need to define column models which specify the schema of data. You can use setColumns() method to define them, like an example below. The setColumns() method receives an array as a parameter, in which each element specifies a column definition. The name property is only required, and it's used as a key of row data. The string value defined as the title property is shown in the column header. It's optional, but it would be better to set it because the column header will be empty without this value. You can specify the input type of the column using the editOptions.type property. If not specified, the type will be a normal, which is plain text that is not editable. The text type uses an input[type=text] element to present the value of the cell. More types like select, checkbox can be used as an editOptions.type. In addition, there are other options which can be used as a property of the editOptions. You can find the details about the editOptions at the API page. You can also define the column models with a columns option when creating the Grid instance. Finally, you can set your data to the Grid using the data option or the setData() method. The data option or the setData() method receives an array as a parameter, in which each element specifies a row data. The data is just a plain object. You can see that the properties of each row data matches the name properties of the column models, that is specified above. Then you can see the table of your data on your screen. You can see the basic example here.